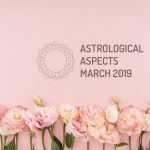 March 2019 will bring significant astrological aspects such as the retrogradation of Mercury in the sign Pisces (from day 05 to 27/03), the entry of Uranus into Taurus (06/03), the entry of the Sun into Aries (20/03), and the passage of Venus through Aquarius (01/03) and Pisces (26/03). What does this mean in terms of the astrological transits of March 2019? Mercury retrograde in Pisces indicates a period to reflect and question the sense of one’s own sensitivity (Do you consider it a weakness, a strength or a simple characteristic of your personality?). On the other hand, the entry of Uranus into Taurus imposes the assumption of problem solving from a creative perspective, but without forgetting the practical implications of each alternative. Likewise, the entrance of the Sun in Aries, reimpulses the work initiated by Chiron in Aries, in everything that refers to capturing the patterns of the ego, and rediscovering one’s own essence. Finally, with Venus visiting the signs of Aquarius and Pisces, in March 2019, we go from understanding love in freedom (respecting the independence of the companion), to the delivery of universal love. Here are some of the planetary events that will affect the astrological transits of March 2019. Enjoy romantic and social experiences. Conflict between the desire for relationship, and restricted freedom that may involve deeper engagement, from the subject’s perspective. Disorganization. Little retention. Decision-making does not respond to a conscious process, which can lead to later setbacks. Self-deception. Pessimism (always imagine the worst scenario). Innovation applied to financial opportunities. Change in economic structures. Practicality. Tenacious behavior, which can undermine the flexibility of opinions (stubbornness). Individualism. Enthusiasm. Self-affirmation. Interest in assuming new challenges. It is necessary to cultivate perseverance in the goals set, and avoid egocentrism. Vulnerability. Longing to merge into a relationship. Sentimentalism. Conciliation. Surrender. Tenderness. The practice of charitable or humanitarian activities acquires a special meaning. In March 2019, the direct phase of Mercury in Pisces means connection with the source of inner wisdom (intuition); inspiration applied to the resolution of conflicts, and the need to empathize with the environment. Impatience. Stress. Rushed value judgments. Non-focused energy. Little prudence in the interaction with third parties, which produces situations from which he prefers to flee.